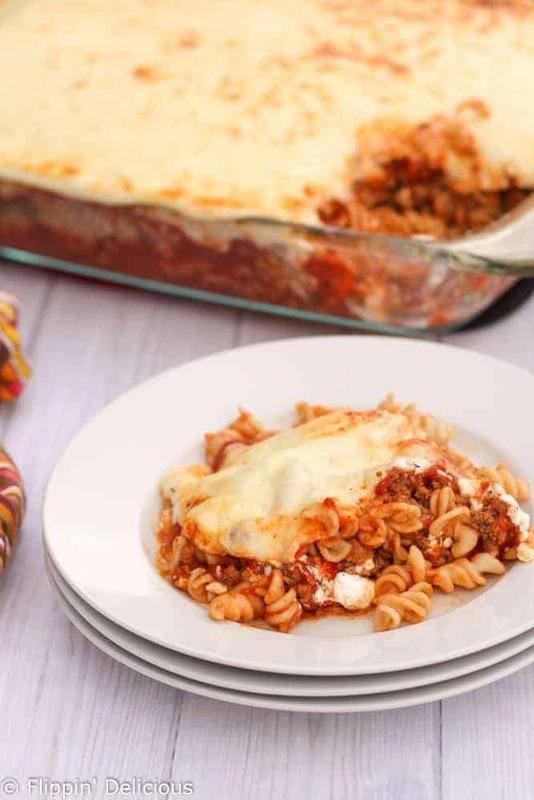 This super easy gluten free lasagna casserole quickly becomes a family favorite. My family calls it dump lasagna, because it is just as easy as lazily dumping everything into the casserole dish. 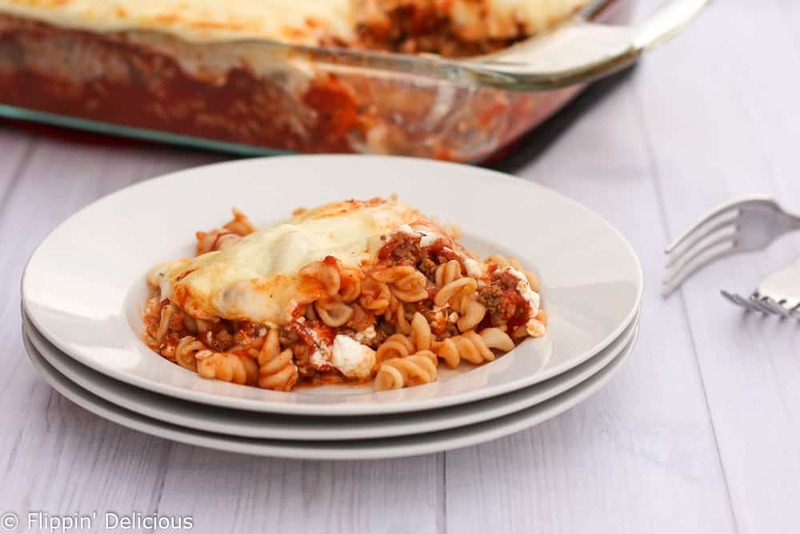 I love this lazy gluten free lasagna casserole, or dump lasagna as my family calls it. It has all the classic Italian lasagna flavors, with just a fraction of the work. I have the semi-unique situation of growing up in a very large family. Even though I am all grown up, married, and have kids of my own, many of my little siblings still live at home. We spend a lot of time with my family, and are at their house often. Last month I got to take road trip with my mom and all of my siblings for one of my sister’s weddings. We had so much fun! I was in charge of baking a gluten-free red velvet cake for the wedding, and more than 300 red velvet cupcakes. Because I was bogarting the kitchen most of the trip, and so that we could spend more time as a family (aka wedding prep,) my teen-aged sister had made several casseroles the weekend before that we could heat up whenever meal time rolled around. This gluten-free lasagna casserole was definitely the favorite of all the gluten-free meals we pulled out of the freezer that week. We all know that lasagna is a classic! 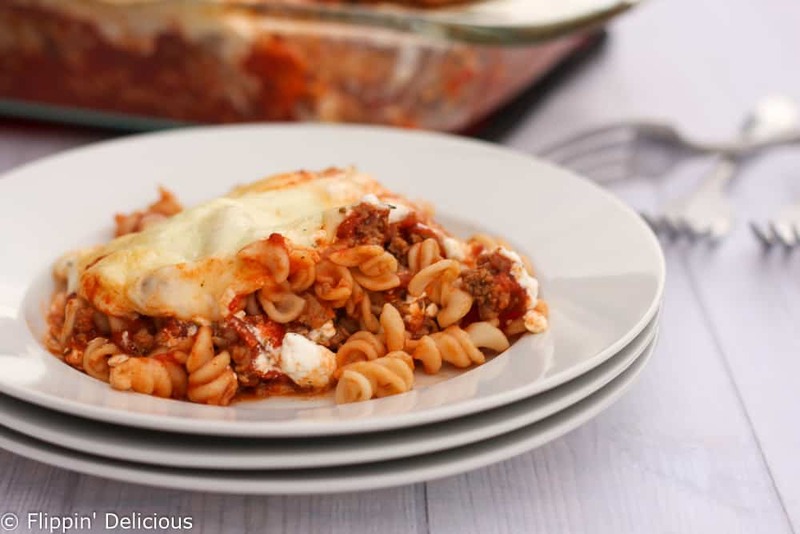 Who doesn’t love the creamy cheese filling, rich tomato sauce, and gooey mozzarella cheese, and tender pasta? The thing that I don’t love is that it isn’t the quickest or easiest meal to prepare. You definitely need to plan ahead if you are making lasagna. Which is why this gluten-free lasagna recipe has been added to my meal rotation! All the classic Italian flavors that we love, but easy enough that I can whip it up on a busy weeknight. My family calls it dump lasagna because it really is just as easy as dumping everything into a baking dish and tossing it in the oven. I hope your family loves it just as much as mine does. Dump lasagna. Love the name! I’m sure my family will love your recipe. Better not tell them what it’s called though. Lol. Haha, yes Maggie! I just can’t call it dump lasagna here on the blog, but a title that probably wouldn’t be widely received. Could I replace the cottage cheese with ricotta cheese? Just tried this recipe and I can confidently say I’ll be having this regularly from now on! I sorta just randomly stumbled upon your site. No one in my family has a gluten sensitivity so I didn’t have to be careful to find gluten free ingredients. However, this recipe just looked so quick and easy, I HAD to try it. Definitely tastes like lasagna! Thank you Michelle! I am glad that you found my site, even if you don’t have to avoid gluten.